This is a common question in dental clinics and a lot of misconception surrounds the subject. Dental fillings have a lifespan. A most common fallacy is that once you have your cavity filled, you are good for life. Unfortunately, it’s not true. Fillings are designed to cover cavities, but they have a limited lifespan. Some last longer than others and the difference comes from the type of filling used. On general classification, there are two types of fillings: temporary and permanent fillings. A temporary filling is an intermediate filling that is put in place for a variety of reasons. As the name suggests, it’s not designed to last for long since it wears out swiftly. A temporary filling is normally used when a patient comes for an emergency visit. There is usually not enough time to relieve the sensitivity or evaluate the tooth adequately for treatment and management. Therefore, the dentist uses a temporary filling and schedules a review appointment as part of the emergency workup plan. Procedures like root canals use temporary fillings because an assessment of the status of the tooth is necessary before laying a permanent filling. Temporary fillings last for around six to eight weeks especially if the reason for the filling is a root canal. 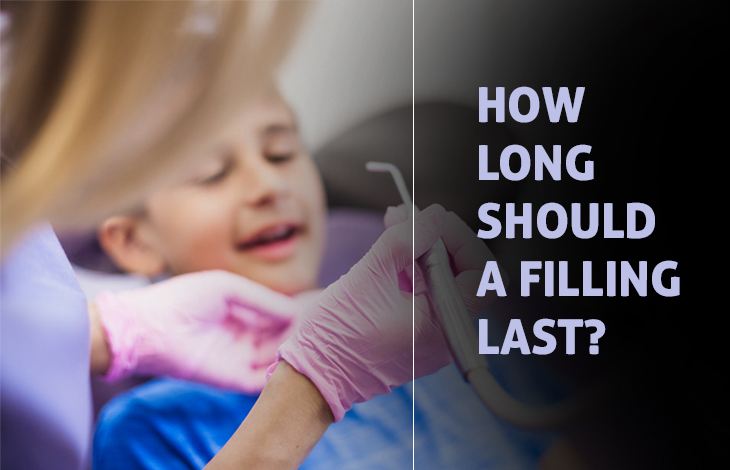 Some last for months but the recommended waiting period for temporary fillings is around two months. It’s crucial to attend your dentist’s appointment if you have a temporary filling. Waiting may cause permanent tooth destruction due to tooth decay or gum infection. The consequence may be permanent tooth loss. Sometimes temporary fillings undergo destruction due to poor oral hygiene and mechanical pressure. If you want your temporary fillings to last till your next appointment, avoid putting unnecessary pressure on the filled tooth and observe good oral hygiene. Remember, temporary fillings are made to be replaced. Also called inlays, gold fillings are an alloy of gold, copper and other metals. Their golden colour appeals to some patients while some don’t like it. Gold fillings are the most durable dental fillings and last for almost two decades. They also offer the advantage of high malleability. Unfortunately, they are the costliest dental filling alternative. The laying process requires more than one dental visit since the fillings need impressions to manufacture at a dental laboratory. Gold foil is a restoration procedure that involves direct placement of the gold filling. It’s rarely performed, and it’s mostly used for small fillings. The advantage of gold foil is that it can be placed in one visit. Silver amalgam is a contemporary filling option that is popular in dental care. It’s strong and durable. The filling is known for its ability to withstand wear and tear. Silver amalgam can last anywhere between 10 to 15 years and it’s a great option for filling decayed areas of the teeth. However, some patients dislike its conspicuous appearance. The silver colour cannot go unnoticed especially when the filling on anterior teeth like the first premolars. The filling can also cause discolouration in your smile. The level of mercury in silver amalgam has raised concern among patients and discouraged its use. Composite fillings are the most popular type of fillings. They are designed to match teeth. The fillings are made from resins contain quartz or glass. They offer long-lasting protection for cavities. White fillings last for an average of 7-10 years and have been used successfully to seal cavities. The application of composite fillings requires minimal drilling. Therefore, more of the healthy tooth is kept intact following the filling. ← Previous Previous post: Types of marble tile: How are they different?